Creating videos on you computer seems to be a bit of challenge for a lot of folks - at least edited and finished video that looks and sounds good. And video editing software programs abound! Oh sure, anyone can upload unedited video that they shot from their phones or camcorder to YouTube directly these days. For some folks, it's fine to just upload the funny clip from the party or the baby's first steps to YouTube. But if you are using videos that need some structure and polish, especially for a business, you need to be able to edit and create something more professional looking. In a discussion with some friends about how to quickly and affordably edit video, people kept mentioning Windows Movie Maker, which is a free program. I had never tried it before, mainly because I had been using SonyVegas Pro for a few years and had just gotten used to it for all things video. 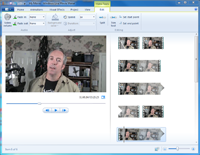 So when I was asked to do a post about editing and creating videos, I decided to try Movie Maker. It may be due to the fact that I am used to working with Vegas, which is very similar to the way most audio software works, that I became very frustrated very quickly using Windows Movie Maker. Where was the audio track? Why couldn't I add text overlays? How could I fade the video in? How could I select just a portion of the video without having to clip it on both ends? It turns out you can't do any of those things, actually. It was very difficult to use. About the only interesting things you can do, apparently, is ad slow pan and zoom effects to clips. You can also apply preset filters to make your video look black and white, or have a color tint to it. But it didn't seem to be at all useful for creating anything like a pro video. 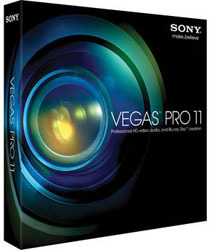 I mentioned earlier that I had been using Sony Vegas Pro for all my video editing, but for most people that's just more than they need - especially in the price department ($599.95). So what can someone do if they don't have the budget for that? They can get Sony Vegas Movie Studio HD for - wait for it - $49.95! Unless you are planning on becoming a film maker, or making really high-end type videos, Vegas Movie Studio really can do everything you will need to edit and create unbelievably great videos on your computer. Compare the picture on the left with the one in the Windows Movie Maker paragraph above. This is the same raw video. The audio track is split out as a separate track as it should be. Each track (the "swim-lane" looking things) has a control panel allowing you an amzing amount of - well - control over all aspects of whatever is on that track. You can mute it, add effects, mix the audio, edit the audio, etc. Then there is the media itself. You can cut, copy and paste intuitively. You can drag the sections of video and audio around, changing the order if you wish. You can fade in or out merely by dragging the top corner of the video or audio. You can also add tracks, either video or audio, and put text over your video. You can edit that text in a myriad of ways - font, size, drop-shadows, color. And that is not to mention the "standard" effects like pan/crop, compositing and 500 effects and transitions. Oh, and did I mention it comes with 200 Soundtracks? These are royalty-free music files you can use with your videos. I know, this is starting to sound like a huge advertisement for Vegas Movie Studio, and that really wasn't my intent. I just don't want you to feel like good - nay, "great" video editing and producing was out of your price range if you didn't have a large budget. By the way, there is a big brother to Vegas Movie Studio called Vegas Movie Studio HD Platinum Production Suite. The main difference is that it comes with DVD creation/burning tools, 160 more Soundtracks, Stereoscopic 3D Tools, and some additional audio tools like support for multi-channel audio, and several other extras. The price reflects the difference at $129.95, but if you can afford that, the Platinum version is truly an awesome value. This will vary with the actual camera, but one thing I have found helpful is to learn how to offload the raw video without using the built-in tools in video editing programs. Every digital camera or camcorder I've every owned has come with some software for transferring pictures and video to your computer. Even if yours doesn't, Windows has its own process for doing it. The reason I recommend doing it this way is that some people shy away from certain software because they thing it isn't compatible with their camera. For instance, I have a friend who said she didn't want to use Vegas because she didn't think it would be able to transfer the video from her camera. Well, if you have the raw video files on your computer already (via the camera's own software, or Windows, Mac etc. ), it won't matter. Simply import the media into Vegas rather than using the "capture tool." I don't think I've ever used the "capture" tool in Vegas. Along these very same lines is understanding the "system requirements" that relate to capturing video. For instance with Vegas, one of the stated system requirements is: IEEE-1394DV card (for DV capture and print-to-tape). This might lead you to believe that if you don't have an IEEE-1394 (which is a fancy way of saying firewire) card, that you won't be able to use Vegas. This is NOT true! If your camera, even HD cameras, can be transferred to your computer via USB (as is the case for my Canon Vixia), then there is no need to capture the video, and therefore no need for the firewire card. So don't let that stated system requirement fool you. Yeah, I know. I didn't say much about the Mac. Mostly that is because I have never owned one and cannot speak from any experience. I do believe that the free video production tools in Mac are much better than in Windows. All Macs these days come with iLife, which includes iMovie video software, along with iPhoto, iWeb, GarageBand (for audio), and iDVD. IF you are a Mac person, you may find you can go further with the free tools. Then rather than Vegas, the big video production tool for Mac is largely agreed to be Final Cut. However, Apple recently killed that program and is replacing it with something called Final Cut X. The jury is still out, but this is the software (the original version) used to edit some of Hollywood's biggest hits, such as The Social Network and True Grit. Obviously there are lots of products not mentioned in this article (which was long enough already:) ). But it should at least give you an idea of what video editing capability can be had for what price, and the relative benefits. 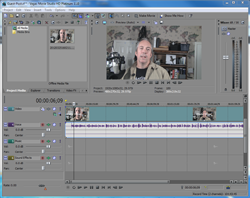 At the end of the day, though I am perhaps a bit biased, I don't think you can beat Sony Vegas Movie Studio HD for value. Your mileage may vary. Thanks for a great rundown on options available. I have been invited to beta test a new app that should allow me to screen capture my iPad and iPhone to my PC... cross your fingers... and I may want to edit some before publishing. I'll be sure to check back to this article when and if I do! Thank you Ken (and Lynn) for a video editing post that doesn't just say "I use a Mac and it's wonderful" etc. Happy to hear about this affordable PC-based video editing software. One that always slips by is Microsoft Expression Encoder. 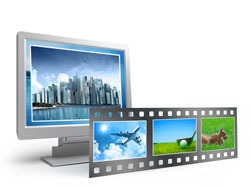 It is perfect for screen capture, webcam capture and other video formats. It isn't quite as feature rich as other suites, but it works well for the basics. Check it out. Thanks for the good review. Windows movie maker is very plain software.